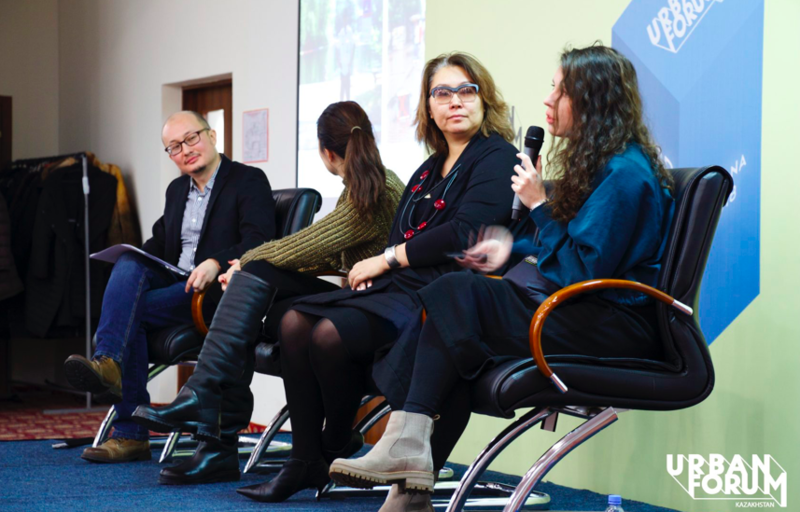 ASTANA – Developing public indoor space will meaningfully improve citizens’ wellbeing and activism in Kazakhstan’s cold and fast-growing capital, said local and foreign experts at Urban Forum Kazakhstan’s Dec. 5 international seminar on the topic. Adil Nurmakov, Dina Baitassova, Indira Makhmetova and Darya Fedotova (L to R). Photo credit: urbanforum.kz. Adil Nurmakov, the public foundation’s co-founder, began by familiarising attendees with the public’s third place, a social environment separate from the first place, home, and the second, the workplace. “These spaces are visited without obligation and are free and open access. They don’t assume a strict format and people are free to assign them functions as they please,” he said, underscoring the importance of churches, schools and public libraries for civil society, democracy, civic engagement and placemaking. Due to its climate, the capital’s parks, squares and streets cannot serve as public spaces as they do in other cities of the world. Since the late 1990s, shopping centres have predominantly become citizens’ third place, providing valuable infrastructure for leisure but none of the public space characteristics such as non-private ownership, round-the-clock accessibility and multifunctionality. “The capital has immense potential for urban development and great demand among its residents for a variety of public spaces,” he added. Building inclusive, functional and productive cities means creating a range of public spaces that meet a variety of needs. The panel sessions focused on public spaces for art, books and communities. The session on community spaces featured Aigerim Kapar, founder of the creative communications platform Artcom. She organises exhibitions, discussions, lectures, workshops and art interventions, often working with museums, art galleries and academic institutions to foster Kazakhstan’s development of contemporary art and culture. She spoke on the way local artists have exhibited ownership over their city through art performances and the social media hashtag #qalabizdiki (the city is ours). “EXPO 2017 prompted discourse on public spaces in Astana, because that is when people had the opportunity to visit spaces that were modern and multifunctional for the first time… Consequently, we decided to conduct a study on the city and its public spaces, which involved art interventions… We traversed from the future, EXPO 2017, to the present, the city’s left bank, to the past, the city’s right bank, holding something that seems familiar in a home, a clothing line with pinned clothes… Our route involved shopping centres, because they are a common gathering place for Astana residents. We wanted to question to what extent these centres are truly public spaces,” she said on an art intervention leading up to the exhibition Time&Astana: After Future. Kapar singled out Kazakh artist Askhat Akhmedyarov’s 2018 installation of chairs on the Kazakh National Academic Library’s stairs as a thought-provoking artwork in a public space. Residents of the fast-paced city were able to reflect on the stationary physicality required for intellectual activity, which was the staff’s creative solution for engaging citizens with the public library. Business trainer and strategic marketing consultant Ildar Valiulov relayed his experience organising and hosting the Spontaneous Stop series of kvartirniks (social home gatherings) in the capital Aug 4.-Nov. 25, which were themed earth, air, fire and water and gathered investors, psychologists, artists and curious citizens for informal discussions and group activities. Similarly, Sabit Naukenov, co-founder of the co-working space Tsokol (Basement), voiced the importance of extending co-working spaces’ benefits beyond the usual target group of freelancers and start-uppers. Increasingly popular but still unfamiliar to non-insiders, such spaces are shared by independent workers seeking alternatives to working from home or an office. Following each presentation, the audience reflected on ways they could develop overlooked public spaces in their daily lives, such as barber shops and kindergartens. International forum. Photo credit: urbanforum.kz. 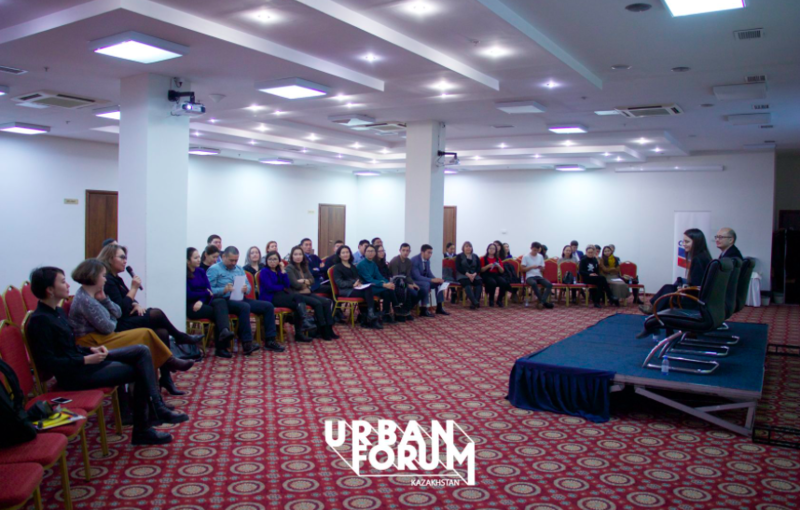 Urban Forum Kazakhstan has facilitated interaction among residents, businesses, authorities and non-governmental organisations to improve Kazakhstan’s urban environment since 2018. Its team of Nastya Goncharova, Aziza Kireeva, Dilda Kulmagambetova, Olga Nikushkina, Assel Yeszhanova and Nurmakov explore local identities and values, sustainable and peripheral development, cities’ child friendliness and grass-root involvement in the architectural and urban planning decision-making process by organising events, moderating discussions, launching various projects and conducting research and educational programmes.